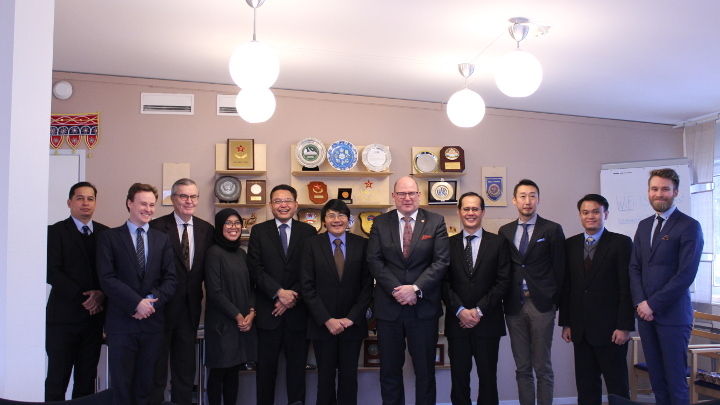 January 29, 2019: ISDP had the honor of welcoming a delegation headed by the Director General of the Bureau for Research and Development of the Indonesian Ministry of Foreign Affairs, Dr. Siswo Pramono and the Ambassador of the Republic of Indonesia to the Kingdom of Sweden, the Honorable Mr. Bagas Hapsoro, along with embassy staff. The meeting focused on the Arctic Council, as well as the possibilities of creating platforms of cooperation between Indonesia and the Nordic countries. Special attention was dedicated to the effects of climate change and the consequent possible reshaping of maritime commercial routes as well as the stakes at play for both sides. The parties identified sustainability and integration as crucial for the development of such cooperation, not only in terms of economic growth but also in terms of dealing with peacekeeping and peacebuilding operations.